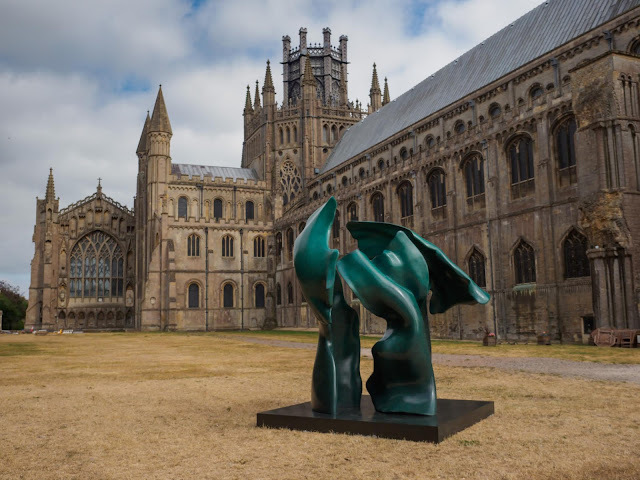 Standing three-meters tall on the front lawn of the 900-year-old Anglican cathedral of Ely in Cambridgeshire, England, Helaine Blumenfeld’s large bronze sculpture, made of three monumental pieces, evokes three torsos possibly carrying another. As it’s often the case with the sculptor’s very organic works, the three blocks in a lovely green patina, could have been configured differently. Here they provide just enough room for the viewer to stand between them and feel embraced by the form. “This is a complex piece. People have to give something of themselves to it, it doesn’t just speak to them, they have to speak back to the work,” remarks the American sculptor, who is regarded as one of the most important sculptors of her generation and is often described as the heir apparent to Henry Moore, with whom she had a joint-exhibition in 1985 in New York. The celebrated artist has spent most of her career expressing very personal feelings such as love, hope and despair, but more recently her abstracted forms have been responding to developments in the wider world. “I’m overwhelmed by the world we live in, by the lack of stability, by the chaos, and complete lack of leadership. We are forgetting that we are all human and are all part of something that is more important than differences,” she remarks, pointing out that she remains an optimist. 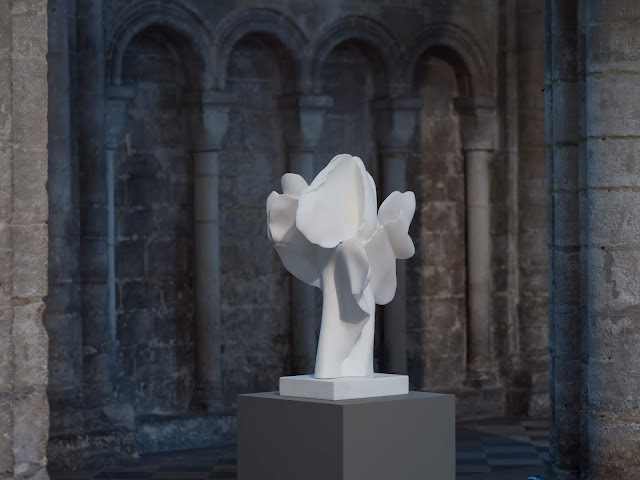 Illusion is part of a large scale exhibition at Ely Cathedral, running until 28 October 2018, which brings together 17 bronze and marble sculptures by the artist, including seven new works, presented inside and outside the cathedral. 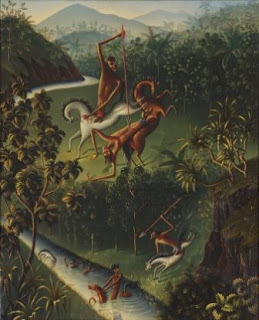 Titled "Tree of Life," the exhibition takes its name from one of the most important series that she has created, which started in response to a comment from her mother on the ‘total absence of spirituality’ of Holocaust memorials, which she felt, failed to convey the immense loss felt then and for generations to come. Blumenfeld’s sculptures have often been described as full of vitality and, quite deliberately, their sensuality invites the viewer to touch them. “As children we learn so much by feeling with our hands. 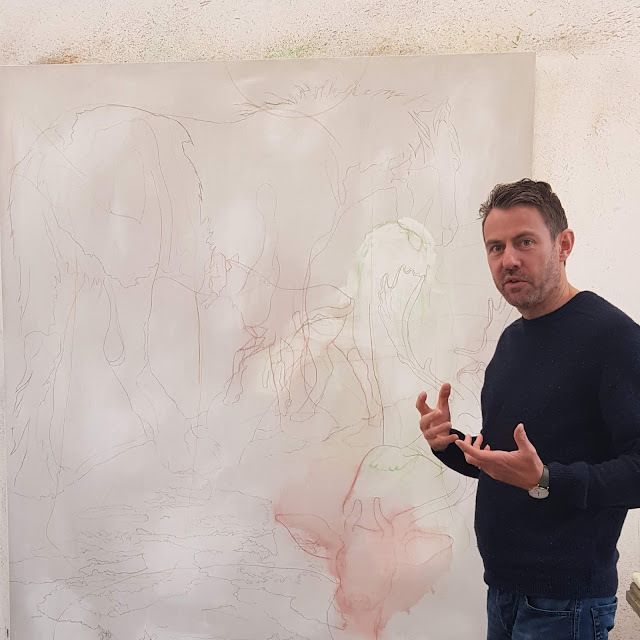 There is another dimension to be gained from my work by using your hand over the surface. The slight undulation of a surface could remind someone a mother’s arms. I believe that if a person is ready to be open to it, sculpture can really take you somewhere else in yourself,” she says. As a child, Blumenfeld had vivid dreams or night visions that she could never quite describe — because “putting those into words would have people look at me and say, ‘What?’” —- and it was her search to express those that eventually led to sculpture albeit after studying for a PhD in moral philosophy at Columbia University. “I first thought it was a matter of language or ideas, so I just kept getting more words, more ideas, more philosophic concepts, but I could still not come close to what I wanted to describe. Then there was a moment in Italy with my husband, in the National Museum of Napoli, when I came across a case of very small Cycladic heads from 2500 BC and each of these, although they only had one feature, gave such a fantastic idea of what that person was like, I suddenly had a feeling that maybe I was looking at the wrong language, it wasn’t words, it was going to be something more visual.” Blumenfeld recalls adding that when her husband got a job in Paris she decided to study sculpture. “Immediately after we got our first bedsit, I got some clay and I was shocked by how I was able to transfer very complex ideas into form,” she says. Her kitchen-table work was impressive enough to get a place at the Ecole des Beaux Arts, but she eventually decided to go to the Academy of la Grande Chaumiere, a less formal art school in the Montparnasse district of Paris where artists such as Alexander Calder, Joan Miro and Tamara de Lempicka had also studied. There she became the student of Russian emigre and Cubist sculptor Ossip Zadkine (1890–1967). “Zadkine believed you should carve everything, so I learned to carve wood when I was visiting him, I learned to work with clay and he even instructed me to start with some pieces of marble,” she says. In the mid-70s, Blumenfeld went to Pietrasanta, in Tuscany’s Apuan Alps where the marble quarries were made famous by Michelangelo. 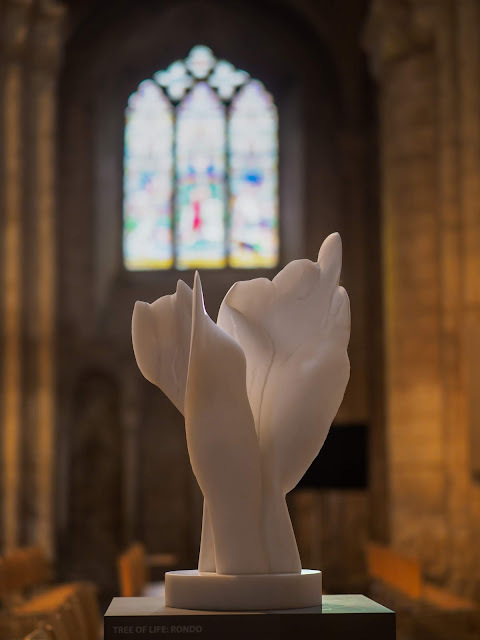 She completely fell under the spell of the translucent statuary white marble, which she felt helped her best express a certain spirituality in her work. 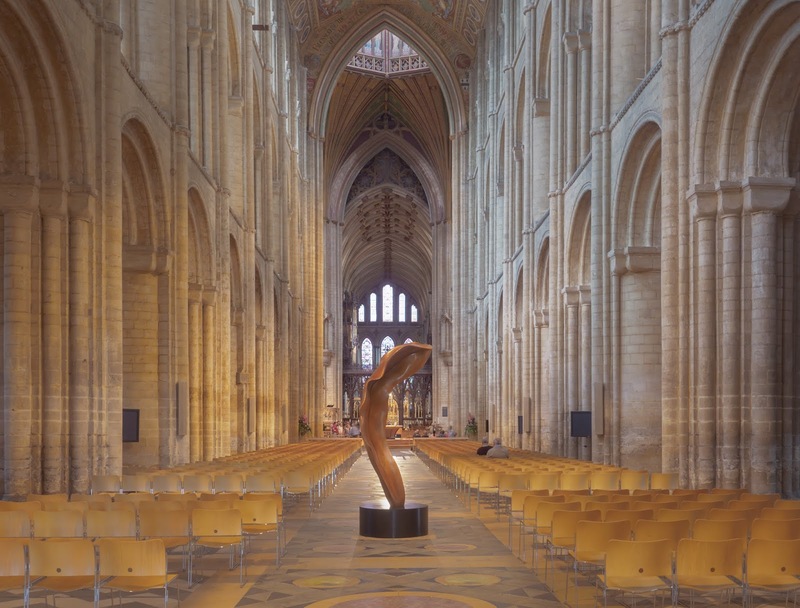 By then she and her husband were living in Grantchester, near Cambridge and she decided to join the Tuscan sculpture studio of Sem Ghelardini which was producing works for Henry Moore, Cesar and Barry Flanagan, amongst others, and Blumenfeld started to apprentice with its experienced senior artisans. That technique has remained with her. “Although I’m not creating flowers, I’m using the same technique. My work is not just one surface, but there is a lot of layering, I go under and create another surface,” she explains. Today, the sculptor retains a studio in Pietrasanta where all her marble sculptures are produced. Blumenfeld gets up early in the morning and will head straight to her studio to work on small clay models or maquettes, which are the starting point for all her works, to ‘draw’ her night-vision in 3D. “This just captures the moment and the idea, then I will upscale. I work quite differently from most artists who still work in clay. I have never used an armature, an inner structure. I always work with clay and work until something happens. That means maybe five or six starts that I won’t pursue. 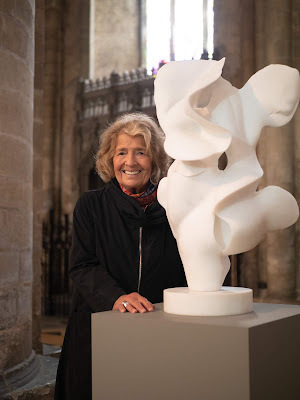 When I have something that I believe in, a sculpture I want to go forward with, then I start enlarging,” the artist explains of her working process. From the start, Blumenfeld’s work has been figure and gesture based, but she has over time abstracted those to convey more intense emotion while retaining the movement and energy. 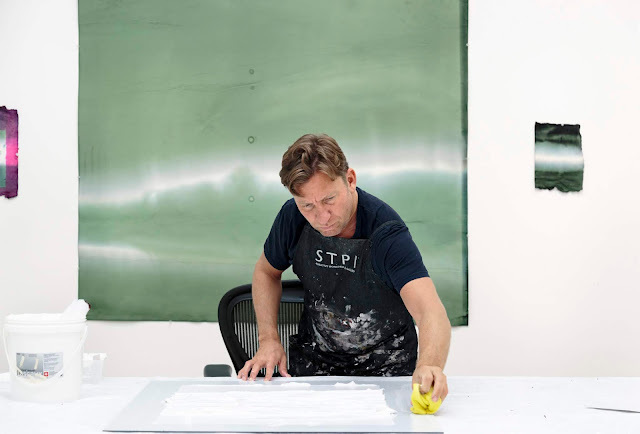 The works’ ambiguity leaves the viewers free to interpret the abstractions, often ‘seeing’ figurative elements in them.